Another great job for our new café at The Old Library Waterfoot – quick, to the point and always finds the right angle for the local press. Oh yes and excellent value too! Ideal for local businesses wishing to enhance their image. Catherine is simply wonderful! She has been extremely helpful to me and my business. 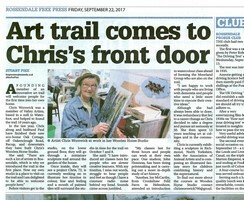 She’s full of bright ideas and has many contacts to help, she even managed to get me on Radio Lancashire. Highly recommended! I have asked Catherine to write me a few stories over the years when I had my accountancy practice and recently my husband’s book Anarquista, every story she has written has found its way into a number of newspapers. It always amazes me, she comes to meet you asks a few questions and then just sits and writes. I have always found she captures exactly what you want to say. A very talented lady. What a lovely professional, thank you for a fun and very relaxed interview with yourself. THANK YOU for the write up Catherine, you did me proud, you made me feel at ease, you were professional, and yet we had such a relaxed interview, it was indeed a very calming experience which was excellent as we were sat in my well-nes room. You were lovely! A great service! Highly recommended! Catherine is a highly enthusiastic lady and she has been an enormous support to M3 Project in many ways both personally and professionally. She produces our Newsletters and writes articles and press releases that have been published in the local and regional papers as well as The Big Issue. Her work has been the foundation of our successful fundraising campaigns over the last couple of years and her excellent local knowledge and connections have been fundamental in helping us to raise our profile in the community. Part of Catherine’s work for our charity involves interviewing some of the young people we support and she has always shown great empathy and sensitivity towards them as well as a genuine flair for ‘telling their story’. Thank you Catherine … we couldn’t do it without you! Thank you for the feature and I will be very happy to see people visiting my studio on 7th and 8th October, either to see artwork and or receive information on my specialised classes. Your photos and information are always spot on or ‘paint on’ in my situation! 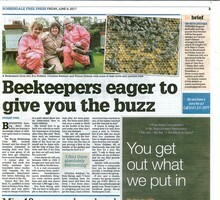 Eva, Wynne and myself asked Catherine to do a write up about a new club we were starting, The Bacup Beekeepers. 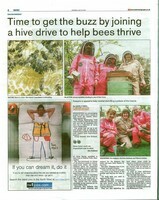 The article she wrote was brilliant raising awareness of the club and the importance of honey bees to everyone. Catherine has a very relaxed manner so it was just like having a friend for a coffee and a chat. She even braved photography at the front of the hive, which gave the article more impact and it made a fantastic full page feature in two papers. Following this, we received offers for land and gained new members at the club. Catherine is very professional from the first point of contact and helps keep you up to date about when to expect to see yourself in print. I would recommend her and definitely use her again. 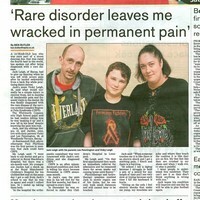 Catherine has just done another story on my son he wanted to raise awareness of his medical condition. We had chosen Catherine to write this story as she has done amazing previous articles on my children and we knew she’d do a lovely story to help him meet his goal and she has. It’s in the paper 4 days after having his interview thank you so much !! Having been put in touch with Catherine for having the same illness (Hyperthyroidism) she advised me to read her blog about her journey to and through surgery. It was like reading exactly what I was going through, that nobody really understands unless they have suffered with it. Everything she was writing was exactly what was happening to me and it gave me great reassurance that I had a chance to recover from this. No amount of google research compared to reading this blog and I can’t thank Catherine enough for for directing me over to reading it. Two weeks post surgery and I’m pleased to say I’m recovering well and very grateful for Catherine’s support along the way. Thank you Catherine Smyth your blog helped more than you can ever imagine. Using extracts from her book Weirdo Mosher Freak, which details the murder of Sophie Lancaster, Catherine presented an anti-bullying lesson to older primary school children. Here is what one parent, and her daughter, thought of the lesson. My daughter came home and said she really enjoyed it, she found it quite challenging I think, but not in a bad way, more in a thought provoking, stimulating, intense way! I think it’s right to get children at this age to now raise their game slightly in preparation for high school and teach them about life at the same time! Catherine has worked with Citizens Advice for many years producing excellent articles about how we have helped local people. She’s great to work with, enthusiastic and reliable. She’s always our go to person when we want local coverage promoting the charity.